When it comes to retirement, there is often a lot of uncertainty and myths around the topic. "I'll die before I am 90", "I'll keep working and never retire", or "Annuities are bad investments" are just some of the often-repeated myths and objections. What are some ways that you can dispel some of these myths about retirement and better prepare your clients for their silver years? Myth #1: I’ll die before I am 90. Reality: Retirees, pre-retirees and advisers tend to underestimate longevity risk when planning for retirement. Our data shows that 1 in 4 65-year-old men with average health will live to age 93; a quarter of women the same age with average health will live to 96. Underestimating longevity risk could pose a significant threat to retirees who use systematic withdrawals as there is a possibility of exhausting their financial resources at an older age. Purchasing a product that guarantees lifetime income reduces the risk retirees will outlive their savings or compromise their retirement lifestyle. Myth #2: I’ll keep working and never retire. Reality: While there are many people who may want to keep working, retirement is not always a choice. 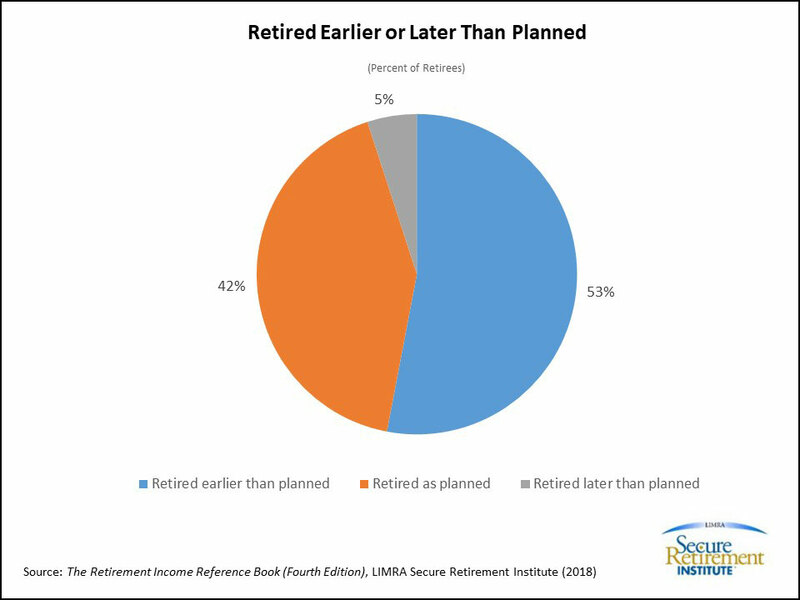 LIMRA Secure Retirement data show that over half of retirees retired earlier than they planned. The most common reason was health problems, which are not always predictable; nearly 1 in 5 said this was the reason they retired earlier than planned. Additionally, LIMRA SRI data show that more than 70 percent of non-retirees expect to work in retirement or transition slowly, but just 16 percent of retirees reported they work. Advisers need to prepare clients for the possibility of early retirement and the impact it can have on their savings and potential lifestyle. Myth #3: Annuities are bad investments. Reality: There are many investors and advisers that may have a negative view about annuities. However, LIMRA SRI data shows that nearly 7 in 10 retirees who own an annuity are more confident their savings and investments will not run out if they live to age 90, compared with 57 percent of retirees who don’t own an annuity. Nearly three-quarters of retirees who own an annuity also are confident they can live the retirement lifestyle they want. Advisers can show clients that income annuities can relieve retirees of the anxiety of managing their investments as they get older. There are many opportunities for advisers to help prepare their clients for retirement by demystifying and debunking common myths around retirement. In doing so, advisers can gain the trust of clients and better serve their needs. The fourth edition of the Retirement Income Reference Book highlights ten common myths of pre-retirees and retirees. While the findings are based on research in the US, there are plenty of lessons we can draw from. Agency Innovation Conference - "Thriving in the Digital World"